If it weren’t for state government’s impending fiscal meltdown, the region would be well positioned for a prosperous future. 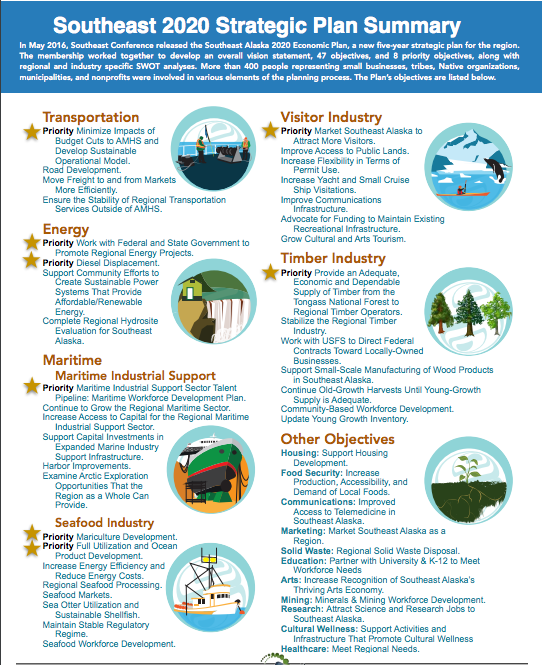 The last five years have been good to Southeast Alaska. People came here in droves, to visit and to live. Our overall population increased by 4% as 2,730 new people joined our ranks. We broke records in terms of visitors arriving by airplane, and 2016 could be our top year ever for total passenger arrivals by all modes. Since 2010, we added nearly 2,000 jobs and $308 million in total workforce earnings, and 2015 was a record year for regional employment and earnings. Yet, despite so many positive indicators, we are not going to continue to grow. As the capital region for the state we are dependent on state government, both for employment and expenditures, and the economic health of the state government is declining rapidly. As wages and disposable incomes shrink, so will the size of the retail sector. Our private sector is scaling back on hiring as it battens down the hatches and prepares to weather this storm. It will take some time for the full extent of these cuts to be felt across the region. For 2016 and 2017, expect the regional economy to remain mostly flat. 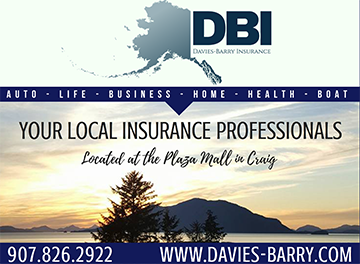 When both private and local hospital healthcare services are taken into account, Southeast Alaska’s 3,294 healthcare workers earned 8% ($182 million) of all regional wages in 2015. Albeit by a small margin, regional healthcare employment fell for the third year in a row in 2015. This in spite of the fact that the health care industry is projected to be the fastest growing in the state through 2022, that health care needs in our region have been increasing due to an aging populace and a (slightly) growing population, and that there have been increasing patient volumes for some major regional providers. There appear to be several reasons for this. The healthcare sector continues to face uncertainty due to the state’s budget shortfall and questions regarding longer-term Medicaid expansion decisions, which is leading medical institutions to not replace departing staff as they wait to see how the state will resolve its budget distress. 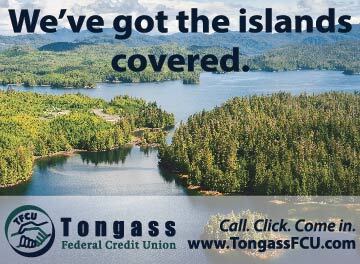 Also, as healthcare becomes more expensive, providers are pressured to contain costs and consolidate “shared services”— meaning that jobs like accounting, payroll, and human resources that used to be local are increasingly being done outside of Southeast Alaska in places where the cost of living is less. Another contributing factor is the influence of medical tourism, as travel to Anchorage and the lower-48 for medial care becomes more common. Finally, with implementation of the Affordable Care Act, there has been intense demand for medical workers at all levels nationwide, which makes local retention and recruitment for regional medical industry jobs more difficult than it had been in the past, leading to fewer hires. 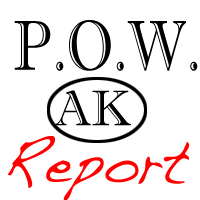 [emphasis added] The forecast is for this industry to essentially remain flat in 2016 and 2017. Government wages made up 35% of all regional employment earnings ($766 million) and 29% of the region’s jobs (13,500) in 2015, but this sector is on the decline, with job losses occurring in every area of government —state, federal, local, and tribal—with the exception of the US Coast Guard. 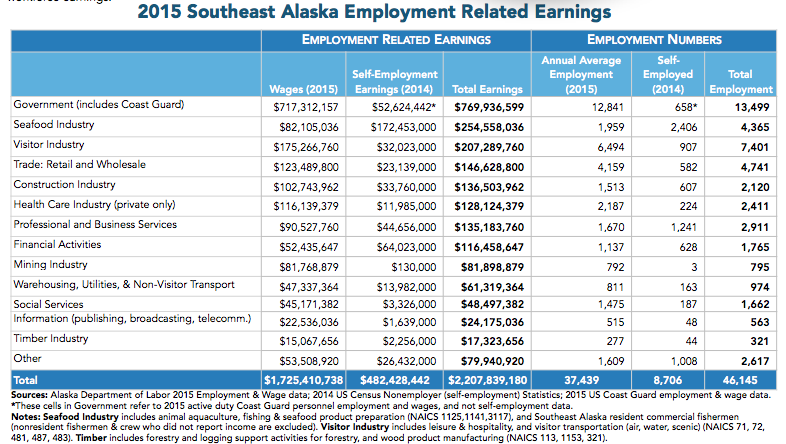 In Southeast Alaska, 14% of all direct wages come from the State. 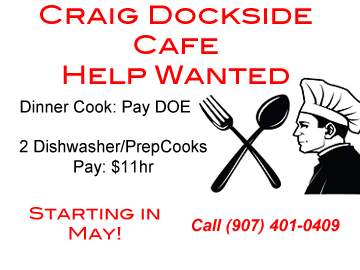 From 2014 through July 2016, nearly 500 State of Alaska jobs were lost with associated annual wages of $28 million. 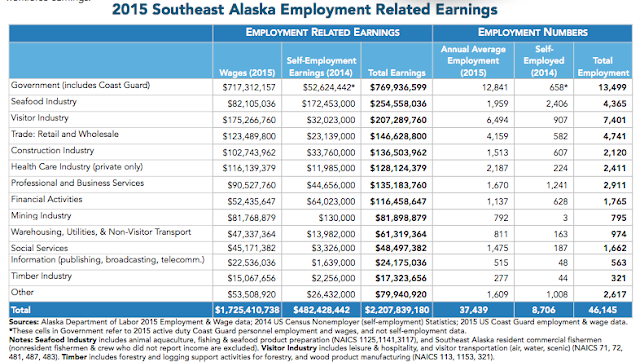 Three-quarters of these jobs came out of Juneau, with Ketchikan losing most of the rest. 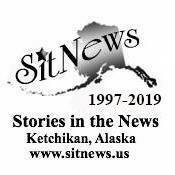 Declining oil production and prices have devastated the State of Alaska budget and are poised to create a significant downward drag on the regional economy. Early job reports from 2016 are grim. Local and federal employment levels are down by 1% each. State employment is down by 260 jobs in the first half of the year, and according to the Office of Management and Budget, further cuts will result in approximately 200 additional Southeast jobs cut by June 2017.
shaker since 2010, growing by 21% for a gain of nearly 100 people. Among communities with over 1,000 residents, Skagway grew by the most, a 7% gain. 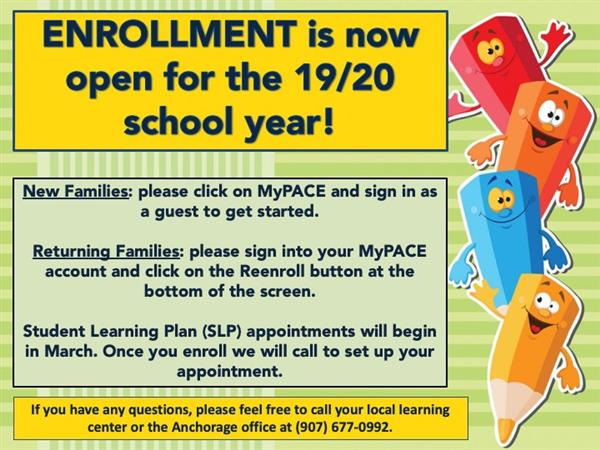 Juneau added 2,000 new people to its ranks, a growth of six percent. 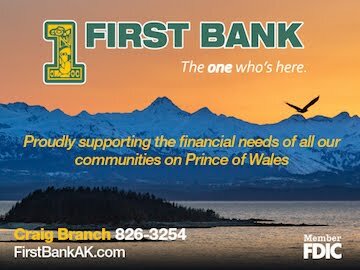 The island of Prince of Wales grew by nearly 6%, thanks to strong growth in places like Klawock, Thorne Bay, and Coffman Cove. Most of these new residents came from outside Alaska, and not from neighboring communities. The number of people moving within Southeast has steadily declined during the past 15 years.